Gas emissions from animal feeding operations (AFOs) create adverse impacts ranging from short-term local effects on air quality, particularly odor, to the long-term effects from greenhouse gas generation. Best management practices (BMPs) have been designed and implemented to mitigate gas emissions from farm operations. Our study investigates emission control strategies widely used in AFOs including manure management and land application. The primary objectives were to evaluate the efficiency and identify improvement of the currently available BMPs. We simulated and monitored gaseous emissions from a range of manure application and incorporation methods. The gaseous emissions were monitored using the closed dynamic chamber (CDC) method with a Fourier Transformed Infrared (FTIR) spectroscopy gas analyzer, which is capable of monitoring 15 pre-programmed gases simultaneously including typical gaseous compounds and greenhouse gases emitted from manure sources; namely, ammonia, carbon dioxide, methane, nitrous oxide, oxides of nitrogen, and volatile organic compounds. In this presentation, we will discuss the efficiency of the current manure management BMPs to reduce air emissions from dairy operations, based on the gaseous emission monitoring during the course of our experiment. Results from our study should enhance development and implementation of more flexible and more efficient air quality management approaches for dairy operations. Why Study Gas Emissions from Manure Application Sites? 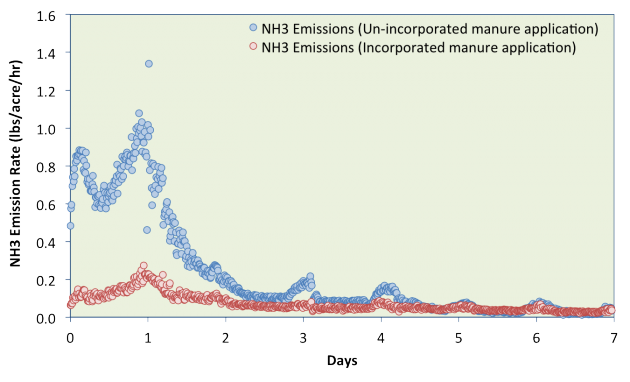 Evaluate gaseous emissions from manure application. Identify ways to improve manure management and land application BMPs. Manure application and incorporation methods were simulated and evaluated in a greenhouse setting. Scraped dairy manure was applied at a rate of 50 tons/acre to a Millville silt loam soil. Incorporation versus no incorporation was compared. Gaseous emissions were monitored using a closed dynamic chamber with a Fourier Transformed Infrared (FTIR) spectroscopy gas analyzer, which is capable of monitoring 15-pre-programmed gases simultaneously including typical gaseous compounds and greenhouse gases emitted from manure sources; namely, ammonia, carbon dioxide, methane, nitrous oxide, oxides of nitrogen, and volatile organic compounds. On Day 3, after emissions had subsided, the soil surface was rewetted. Emissions were monitored for 7 days. 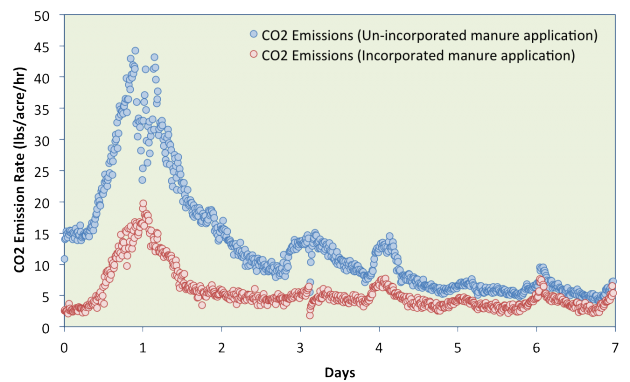 Emission rates for CO2 and NH3 peaked after 24 hours, with the majority of emissions occurring within the first 2 days. Rewetting had limited impact. Based on this data, it appears that rapid incorporation is needed to have a meaningful impact on reducing gaseous emissions. Examine gaseous emissions from a range of manure application and incorporation methods in a field setting. The gaseous emissions will be monitored using the closed dynamic chamber method with a Fourier Transformed Infrared (FTiR) spectroscopy gas analyzer. Sutitarnnonntr, P., R. Miller, S. Bialkowski, M. Tuller, and S. B. Jones. 2012. A Multiplexing System for Monitoring Greenhouse and Regulated Gas Emissions from Manure Sources Using a Portable FTIR Gas Analyzer. ASABE 2012 Paper and Presentation No. 121337982. St. Joseph, MI: American Society of Agricultural and Biological Engineers. The authors gratefully acknowledge support from a USDA-CSREES AFRI Air Quality Program Grant #2010-85112-50524.